I mentioned earlier, San Diego is one of my favorite cities and headquarters hotel, the U.S Grant, a favorite hotel. 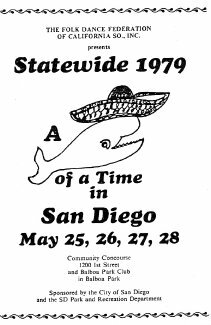 And that program, "A Whale of a Time in San Diego," May 25, 26, 27, 28, and 29, says it all for the 34th Annual Statewide Festival, 1979. The Opening Party Friday took place at the Balboa Park Club with an after party at the U.S. Grant. The Institute was held Saturday afternoon in the Golden Room of the Community Concourse, with the After Party upstairs in the Copper Room. On Sunday afternoon we were asked to bring our cameras and take pictures prior to the Concert. Sorry but we do not have a Concert Program to give all the details. Following the Concert there was general dancing as well as dancing later that night, all in the Golden Room. Less we forget, there was general dancing and Balkan dancing after each and every Dance Party. Installation Brunch, with Alice (Hauserman) Sterling, MC, was held in the U.S. Grant. After introductions and camp announcements, Bruce Wyckoff of the North and Dorothy Daw of the South proceeded to install themselves, as they were to serve an additonal term, after which they got around to installing the other officers, to make it legal. No Past President's pins today. No Picnic Monday but a full afternoon of dancing with the pre-Kolo Hour. Thanks to Vivian Woll and Evelyn Prewett and the entire Committee, some of whom we would like to recognize: After Parties, Ray Garcia; Concert, Gene Ciejka; Decorations, Kathleen Coe; Installation Brunch, Doris Dodge and Norma Tuttobene; Installation Program, Alice (Hauserman) Sterling; Institute, Sheila Ruby; Masters of Ceremony and Callers, Valerie Staigh; Pre-Registration, Fran Slater; Publicity, Pearl Bleadon; and a host of others. 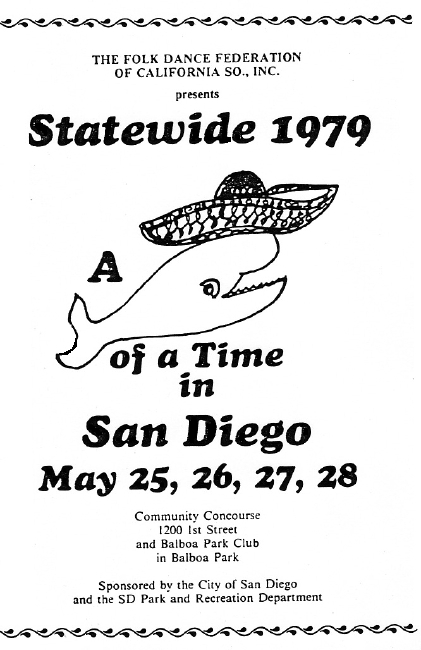 Once again San Diego has shown they know how.